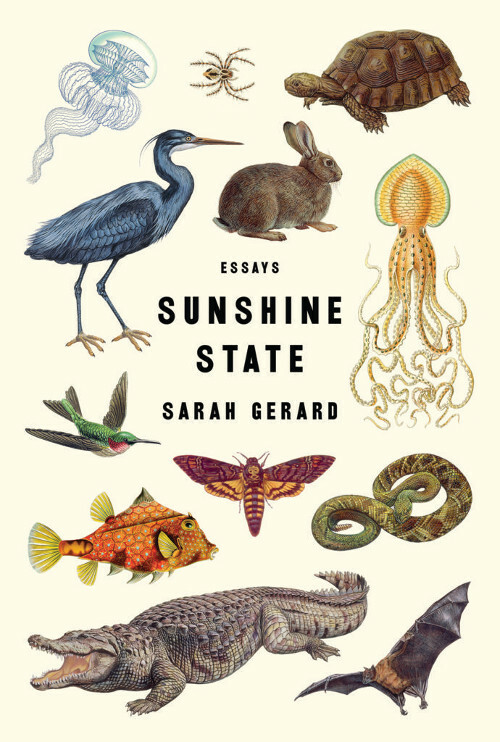 Sunshine State, by Sarah Gerard. New York, New York: Harper Perennial, April 2017. 384 pages. $15.99, paper. Counter to familiar ideas of Florida: spring break, the spectacle that is South Beach, and golfing old-timers, in Sunshine State, Sarah Gerard offers periphery, rather than underbelly or façade. Gerard, a Florida native with a fascinating past, examines the cultural phenomena that shaped her family’s story. She writes with insight and empathy, never once disparaging her subjects, many of whom have not had easy lives. The pieces in this collection, while all Florida-centric, each have their own approach. Some are quite personal, while others tip towards journalism, perhaps because those pieces needed contextualization. Gerard is quite capable in both arenas, as she is a thorough investigator, as well as an essayist willing to implicate herself. She portrays Florida and its inhabitants in a way that feels both seedy and fresh. Unlike another popular writer tackling a region and its travails, Gerard never condemns. To her credit, the characters aren’t treated as oddballs or gullible, but rather as specific, and in this way, she raises them up. While she leaves plenty of room for the reader to assemble conclusions, she never professes to have answers. In the opening essay, “BFF,” the author places her life parallel to that of her childhood friend, and then shows how their trajectories veered. We see Gerard at her most self-critical; guilt and love oozes through every white space. That Gerard went to New York and became a writer, while her friend spent time in a girls’ home, became a stripper, and struggled with addiction throughout her young life, has weighed heavy on the author. The essay establishes the Gerard as the one who left, a fact of importance throughout the book. If I could quantify what came between us: the cost of tuition. If I could quantify what came between us: the cost of your mother’s one-bedroom rent subtracted from my parents’ four-bedroom house in a gated neighborhood. If I could quantify what came between us: the cost of diapers, formula, hospital bills. Their closeness, spectacular in that teenage best-friendy way, untwines. The parting is one we can imagine or have lived through: one could leave, and the other could not. One was burning at a slow smolder, the other shot out of a cannon. The author gives herself less credit that others might, a strategic move that works. You can force people to love you. If you doubt their commitment, you can force them to prove themselves. You can do this to them over and over, and you will be justified, even when they say they’re tired. The love of a friendship should be limitless. You should be prepared to do anything for each other. Gerard makes the argument that she is both absolved of and saturated in guilt. Her stance conflicts with itself, not unlike the place about which she writes. Gerard gives the fascinating history of Amway, which is a crazy phenomenon on its own. (Hint: this is where the DeVos millions originated.) While her family did well under Amway, they never reached diamondhood. The author makes good use of the missed pinnacle, investigating the what-could-have-been. Years after, Gerard and her husband take on personas—winners and bigger winners—and tour the varying strata of luxury and luxury-plus homes in communities built with Amway money. As with many of these pieces, the inspection of this cultist organization has voyeristic appeal. I was, however, left wondering if the author felt a sense of loss at the family’s turn back from the impossible, or whether, now, as an adult, she feels pure relief. Gerard writes with journalistic acuity while acknowledging place in the story, both of this place and as one who left. She reflects upon what it meant to grow up here, what happens when the curious or extraordinary is the everyday. In truth, what “ordinary” means, is that you are used to a thing. It is when one leaves, be it from a religion, a pyramid scheme, a dystopic community, that the useful lens appears. In “Mother-Father God,” Gerard recounts her early childhood as a child-member of the Unity-Clearwater Church. While no Amway, the church did have its share of indoctrination, pressure, and of course, scandal. She writes of her parents’ personal involvement in the church, their relationship to religion, as well as the histories that brought them there. The essay gets a bit heavy with facts on the church’s history, as these parts are almost all research. Throughout, the sections devoted to Gerard’s mother are the strongest, perhaps because we are shown her evolution. The title essay is captivating, or I should say, hard to forget. “Sunshine State” is about the Suncoast Bird Sanctuary, a site Gerard visited as a child. She recalls it as a wild and exotic place, sort of the way many of us think of Florida. Started with good intentions, over time, it turned into a legal, financial, and physical quagmire. The collection’s several other pieces leaning closer to the braided narratives often seen in memoir. “Rabbit” is about Gerard’s relationship to her grandmother, but also to her grandfather’s passing and to the inevitability of aging. Gerard’s personal and familial history work well as connective tissue through book wildly varying topics. “Rabbit” stands out as the most familiar-feeling of the essays both in topic and style. Sunshine State is both formally and topically varied. The collection lands somewhere among memoir, investigative journalism, and place narrative. Gerard is particularly adept in long-form essay, in both her choice of topic and the mix of facts and personal story. The thread throughout, not about location at all, is why we join, or why we need to group. We fall for bad boyfriends, stay with religions that betray us, devote our lives to murky causes. In the end, I’m not sure I know Florida (can anyone ever? ), but I now know Gerard’s Florida, which is infinitely more interesting.